Yesterday, I was preparing for a huge snowstorm. Some people said a Nor’ Easter was coming. But sadly, it looks like we’ll only get a few inches of snow. Because of the storm, I had to go grocery shopping a day earlier, which I’m glad I did. At our local Shaw’s (which I try to only shop their sales cause it super expensive) I found pork roasts for $.88/lb & split chicken breast for $.99/lb. At those prices, I had to stock up on my meats, since we were running low. I don’t about you but I haven’t cooked many pork roasts since they are usually expensive. So I treated it just like a chicken roast this time around, using lemon juice, pepperoncini, and spices. And it came out super delicious. The aroma filled my kitchen all afternoon. IT cooked so well, it was falling apart, making it easy to shred it. This was a comfort meal, perfect for a day like today. If you make this, I promise you, you won’t be sorry. It’s definitely worth a try. Simple & delicious. 2. Dump the lemon juice on & then add the garlic. 3. Add the rest of the spices to the top of the roast. 4. Turn roast over so that way some seasoning comes off and will season the bottom of the roast. 5. Cook on high for 6 hrs or so, depending on size of roast. 6. 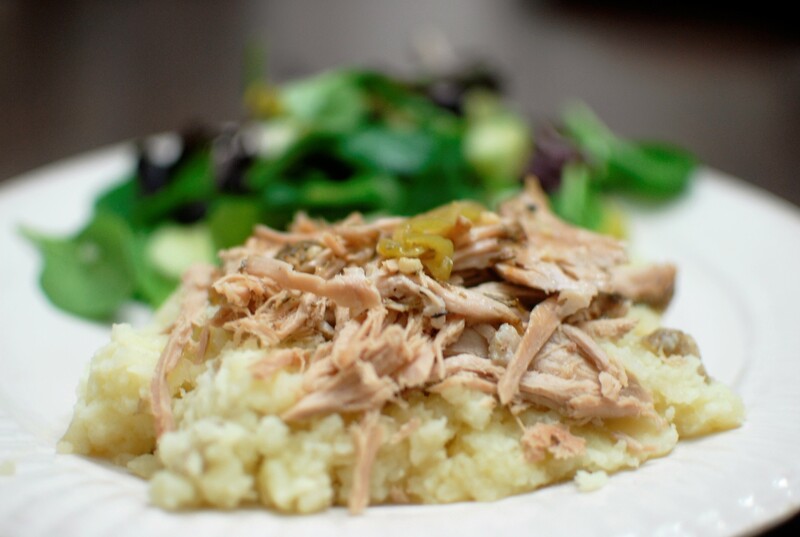 Slice or shred the pork & serve over mashed potatoes or rice. How do you cook a pork roast? I am like you I hardly ever cook pork roast. But the one time I did I just used herbs from my herb garden and cooked it in the oven! I will be pinning to pinterest your recipe! Thank you for sharing and it looks fabulously yummy! Sounds delicious. I so miss my garden. Spring can’t come soon enough. Thanks for the pin 🙂 And for visiting, hope to see you back again. Have a great rest of your day. That sounds like a fabulous dish for a cold winter’s day! I have a chunk of pork and wasn’t sure what to do with it, so I may try this. How many pounds of pork roast do you use for this recipe? I used a 4 lb roast. If you try it, I hope you enjoy it as much as we did. Thanks! I wanted to make sure I had the proportions of meat and spices right. I’ve got three lbs in the freezer, so I think I’ll make this up for our coming snowstorm! looks yuuum Amy..And as I don’t eat pork, I guess chicken will be a great alternative as well. Cheers..